ATTN: Britax owners. If our product is too short, please check to be sure your LATCH straps are in the forward facing position. Whether flying on an airplane or traveling by train or bus, it is safest and most comfortable for your child to be in a car seat. But traveling with a young child, their seat, and your carry-on can be tricky. Not anymore. The Traveling Toddler strap allows you to attach your LATCH and top tether equipped toddler’s car seat to a rolling carry-on suitcase. Simply attach the LATCH and top tether straps from the car seat to the Traveling Toddler and adjust the straps so that the car seat is held securely on the suitcase. 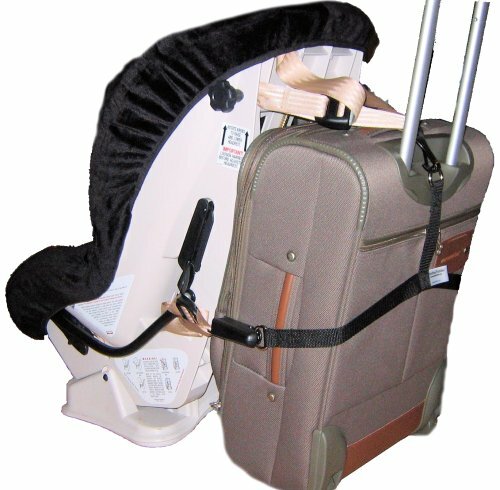 Once adjusted, the car seat can be detached and reattached to the suitcase in seconds. Lift the handle of your carry-on bag and you have a fun new stroller. 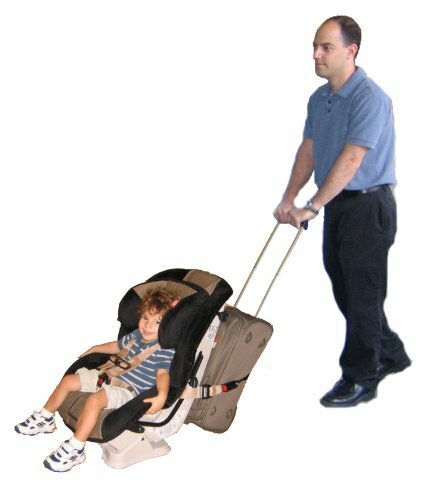 Now there’s an easy and inexpensive way to take your toddler’s car seat and other gear on your trip. You do not have to buy a special seat or suitcase. As long as your suitcase handle locks in place, you can push it like a stroller. Your hands are free for check in and its simple to unhook for security. 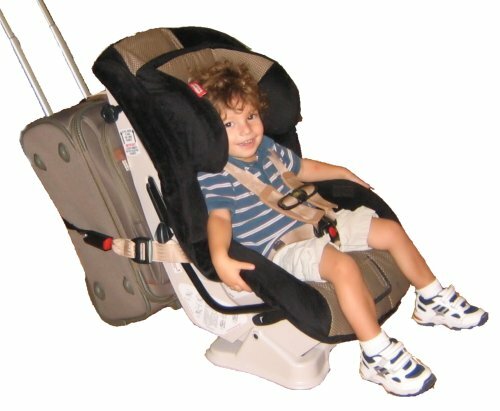 Keep your child safe and comfortable in their own seat. The Traveling Toddler has been tested with most major car seat brands including Graco, Eddie Bauer, Cosco, Evenflo, and Britax, and a variety of carry-on suitcases and has worked with every combination. It is important that the telescoping handle of your suitcase locks in place. If not, it might not stay extended when you try to push your child in front of you, though you would still be able to pull them. If flying, make sure that your car seat is FAA approved before traveling. The Traveling Toddler strap is made from heavyweight polypropylene webbing that will withstand 900 lbs of force. When not in use it easily slips in the pocket of your carry-on. As with any other wheeled child carrier, do not use the Traveling Toddler on stairs or escalators. Car seat and suitcase sold separately. Patent pending.Quickly and easily connect your toddler’s car seat to your rolling carry-on suitcase.